More photos at my Flickr photostream! I attended the Nipponbashi Festa 2010 in Den Den Town, Osaka, this weekend for the first time, and I must say it was quite an experience. 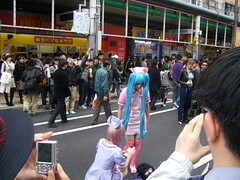 Crowds filled the streets from Ebisucho to Nipponbashi, and fans and shop promoters alike went all-out with costumes representing their favorite anime, manga, movie and video game characters. In case you didn’t make it to the festival, check out the photos and videos (including footage of the maid parade!) at my Flickr photostream.